It was a packed room at the Gray Academy of Jewish Education during Rabbi Zvi Hirschfield’s session on gossip at Winnipeg’s Limmud festival in March. 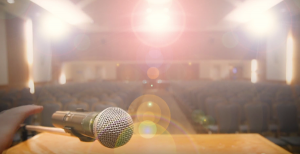 Some 80 attendees listened as Hirschfield steered the dialogue through biblical excerpts, and a discussion of gossip from ancient times to today. Hirschfield grew up in Chicago. He studied for a number of years at Israel’s Yeshivat Har Etzion. After completing a BA in history at Columbia University, he did graduate work at Harvard University in medieval and modern Jewish thought. He received smicha from Israel’s Chief Rabbinate and has taught adult students of all ages at the Pardes Institute in Jerusalem for 15 years. Hirschfield lives in Gush Etzion with his wife, Dena, and their four children. Gossip, he told those gathered, is destructive in many ways. Gossip can include inaccurate information, it can ruin reputations, it often lacks context and is especially subject to interpretation by the gossipper. Even praise can be considered verboten, he said. “Even if I say something outright nice about somebody, the rabbis still seem to be saying that we should be very careful about that,” said Hirschfield. Hirschfield went on to talk about Moses (Moshe), who was referred to in the Torah as an anav [humble person]. He explained that this means Moses “was not in it for himself, not wanting his position for himself…. He felt his [brother Aaron] would be hurt and his only reaction was concern for his brother. It should be that way. An anav is somebody who doesn’t put themselves at the centre. Self-interest is not inherently bad, however. “We’re never going to be without self-interest,” he said. “We’re never going to lose our egos. We’re never going to lose that sense of … the way I figure out how I’m doing is by looking at other people. We’re human beings, and that’s clear. The focus, then, can be on the building a “holy community,” he said. “I think, for all of us here, that’s a way we can think about. How engaged am I in creating holy community? How committed am I to trying to build something with other people as opposed to building up my own ego by competing with others and tearing them down? 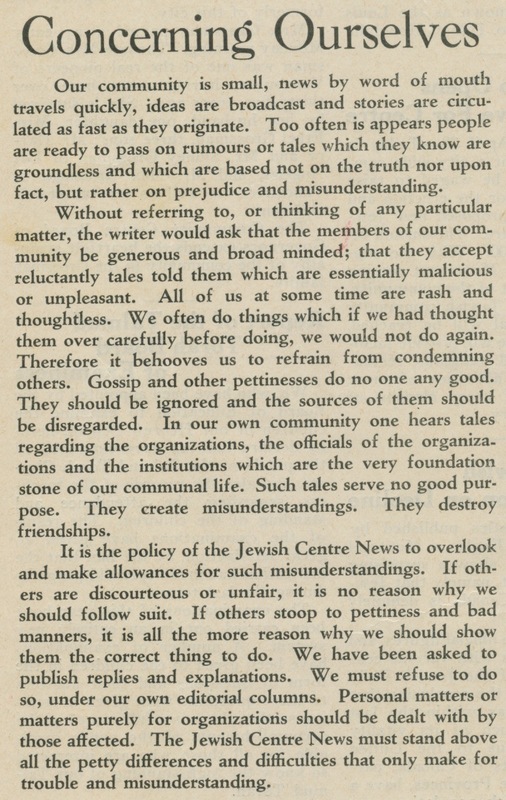 The effect of gossip has always been a concern in the Jewish community. Reading this story on Limmud Winnipeg’s session on how Judaism views gossip reminds us of an editorial from the very earliest days of the Jewish news here in Vancouver, from May 1, 1930.